knew about their cerebral-stimulating effects. under direct vision (surgical exposure). absorption and advocates the use of epinephrine. 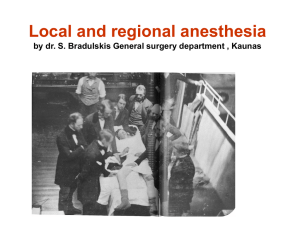 1898 Bier performs the first planned spinal anesthesia. hydrochloride salts, which are hydrosoluble. other is an amine group that is ionizable and watersoluble (hydrophilic). needle in proximity to the target nerve(s). solution gets absorbed into the circulation. duration and nature of the interaction with the receptors. for hydrophobic drugs is greater. Related to duration of action. 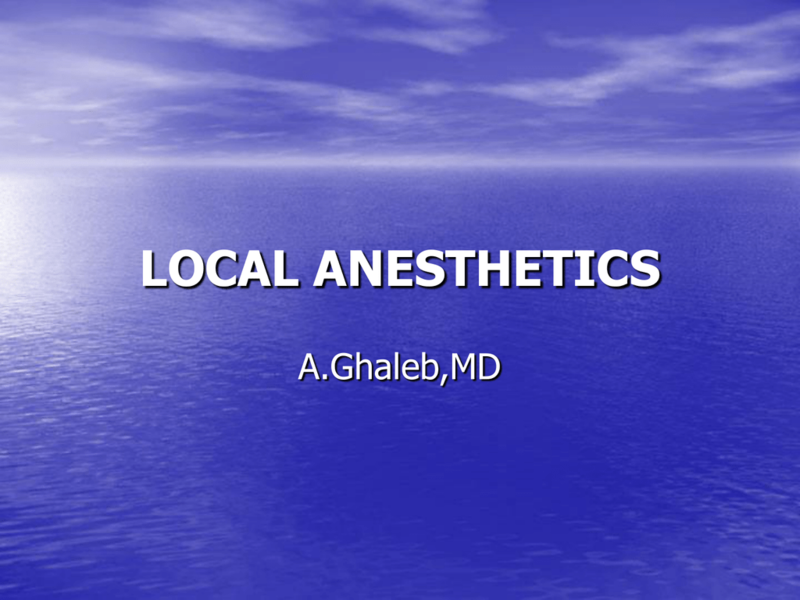 mepivacaine > lidocaine > procaine and 2-chloroprocaine. anesthetic binding to plasma protein (similar amino acid sequences). into liposomes to prolong the duration of action and decrease toxicity. protein (similar amino acid sequences). ionized (cationic) and the uncharged (base) form of the drug. 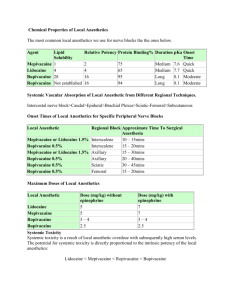 The pka for local anesthetics ranges from 7.6 to 9.2.
ionized and 50% is present as a base. bupivacaine with a pka of 8.1 which is only 15% non-ionized). to blocking of sodium channels. between the non-charged and charged (BH+) fractions. increases. This fraction interacts with the Na+ channel. 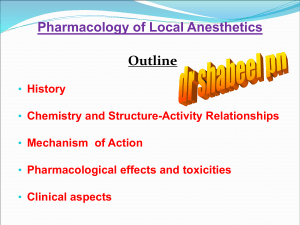 involved in ion movement and local anesthetic activity. S4 helices are both hydrophobic and positively charged. conformational changes from the closed (resting) state to the ionpermeable state or open state. the proteins leave the channel still closed and ion-impermeable. With repolarization the proteins revert to their resting configuration. anesthetic than one that is being stimulated. block) may be present during pregnancy. drug in the pregnant patient. while for bupivacaine is 0.3 (pka 8.1). blocked more readily than larger myelinated fibers. nonmyelinated fibers of the same diameter. postural, touch, pressure and motor information). before sensory fibers in large mixed nerves. ionized hydrophobic (lipid soluble) base form. 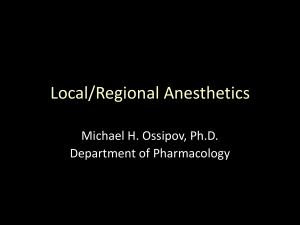 penetration of the local anesthetic through the nerve membrane. 4.5 to 7.2 by the addition of bicarbonate. solution is maximal (a saturated solution). 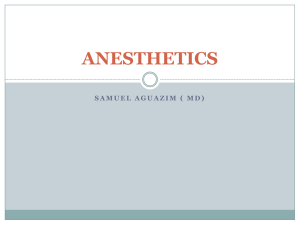 lidocaine and bupivacaine. The mechanism is unclear. urination, which may delay discharge. associated with arrhythmias or other undesirable cardiac effects. 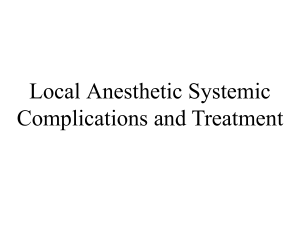 intravascular injection and prolongation of action. peripheral nerve blocks from 186 minutes to 264 minutes. from the use of more diluted epinephrine (1:400,000). 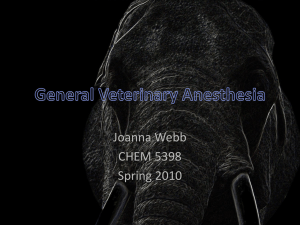 anesthetics and when given orally. 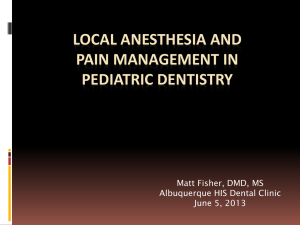 at least in the epidural space to decrease the quality of anesthesia. Its use seems limited to retrobulbar blocks. potentially could lead to plasma accumulation. contain PABA as a preservative. liver are: hepatic blood flow and hepatic function. 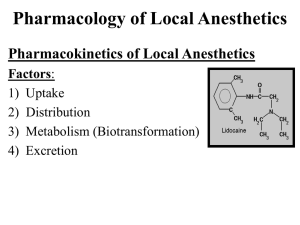 would affect the metabolism of local anesthetics. while for bupivacaine is 10% to 16%). vascularity and use of a vasoconstrictor. produces a 1.5 ucg/mL plasma level. – CV toxicity is increased under hypoxia and acidosis. muscular activity decreases the severity of acidosis. 10 min, followed by 1 mg/min for 6 hrs then 0.5 mg/min. 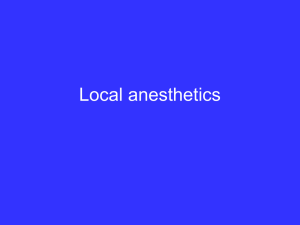 of local anesthetic that usually exceeds the maximum recommended doses. epidural), organ dysfunction (especially for repeated doses) and pregnancy. than Hb and 02Hb at 940 nm but simulates Hb at 660 nm. metabolized to para-amino-benzoic acid (PABA). associated with the antioxidant bisulfite. after epidural in ambulatory patients. ability to pass through membranes.